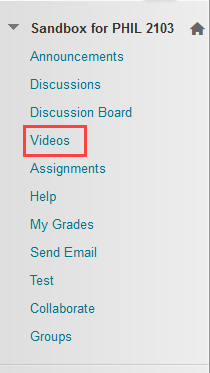 Using Kaltura to create videos to insert into Blackboard is a useful pedagogical tool. But even better, Kaltura allows you to create video quizzes to give your students. You simply use your existing Kaltura media or create new media and use the tool to insert questions into the video! This allows you to test student engagement during videos or to ensure that they understood the goals and purpose of the video for the course. Read on for instructions on how to utilize the video quiz feature of Kaltura. 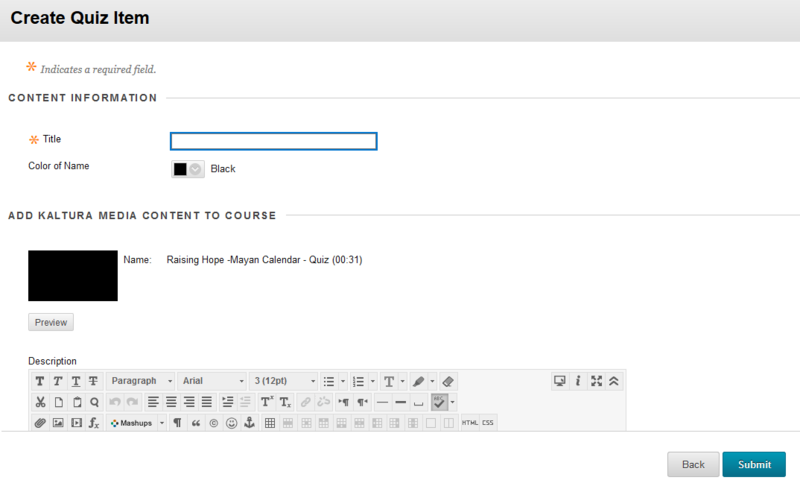 Using Kaltura to create videos to insert into Blackboard is a useful pedagogical tool. But even better, Kaltura allows you to easily create video quizzes to give your students. 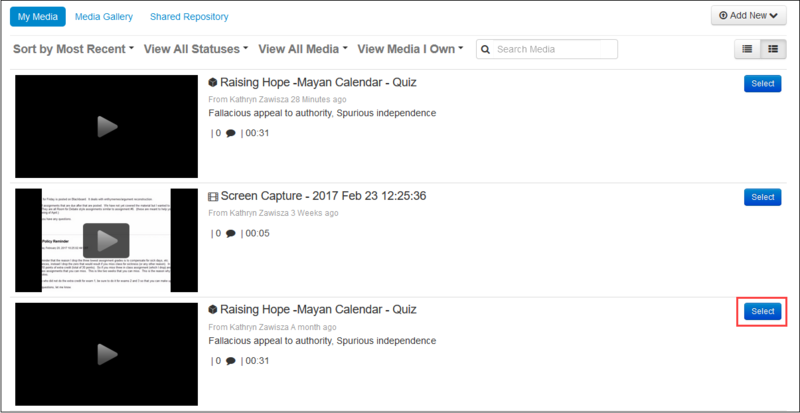 You simply use your existing Kaltura media or create new media and use the tool to insert questions into the video! This allows you to test student engagement during videos or to ensure that they understood the goals and purpose of the video for the course. 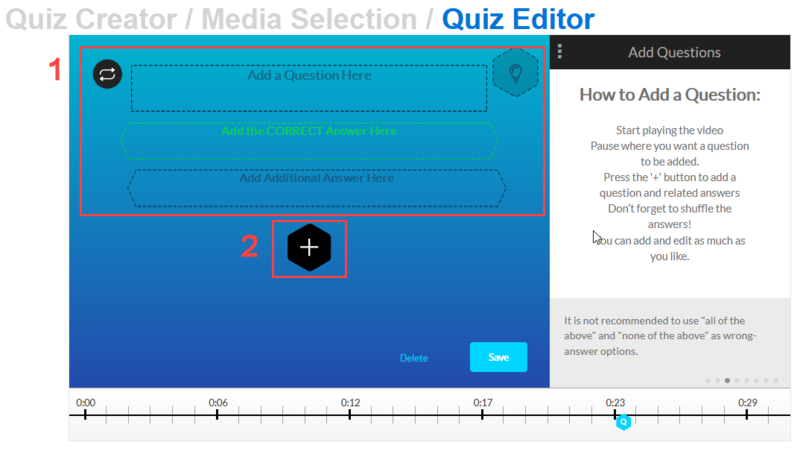 Read on for instructions on how to utilize the video quiz feature of Kaltura. 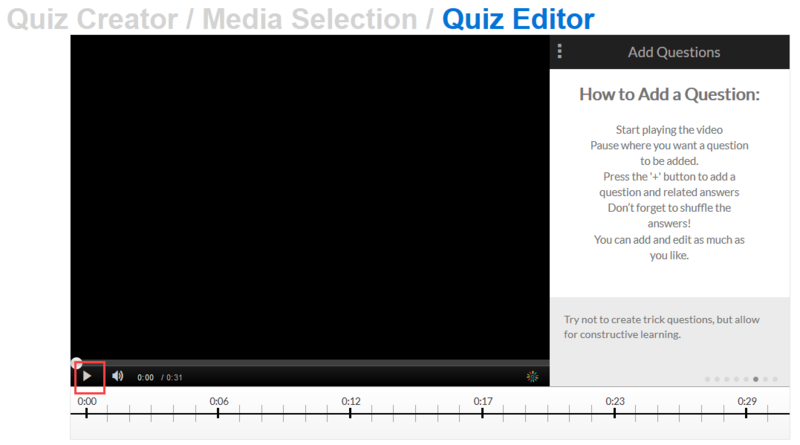 Click the Select button next to the video you wish to use for the quiz. 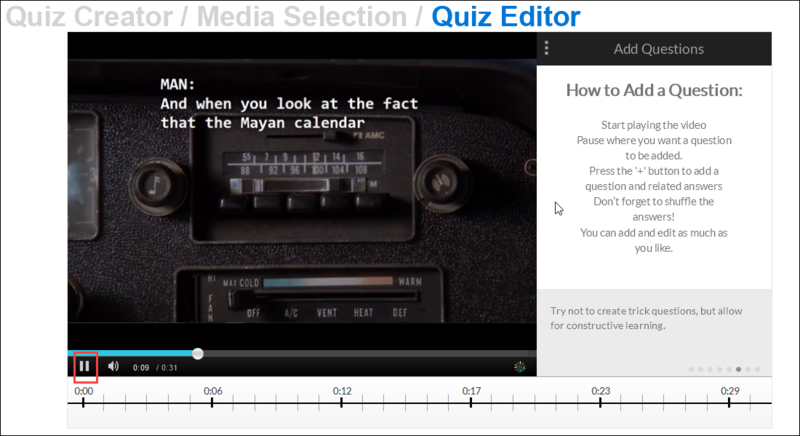 Select the quiz settings you wish to use by looking under the “General” menu located on the right of the video. Click Apply to move on to the next set of settings. Repeat until finished. To begin adding questions, click Play. Notice that the Quiz Creator provides helpful information to the right of the screen. Click Pause when you want to insert a question in the video. Then Click the + button that appears in the middle of the video. You will be prompted to enter the question and the answers. To add an additional answer click the + button under the answers. If you want the question answers to appear in a different order (so the correct answer is not always listed first), click the double arrow button to the left of the question. When finished with the question and answers, click save. Repeat steps 6-12 for the rest of the video quiz questions. 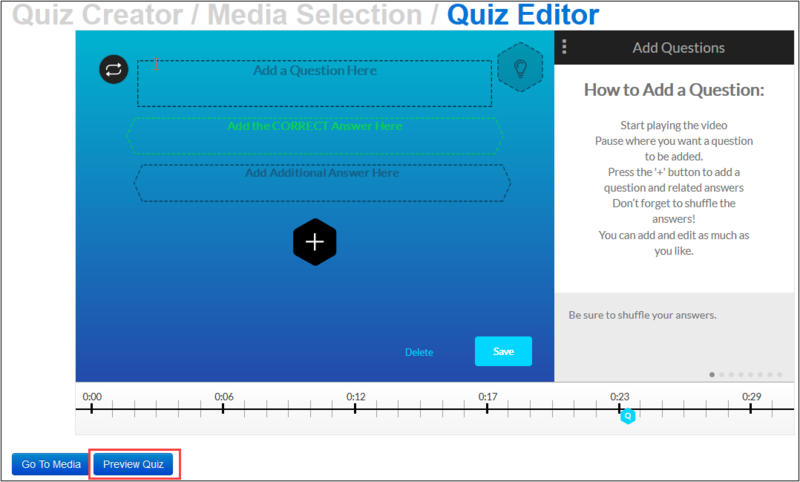 When finished you can click Preview Quiz to see what your quiz will look like for the students. Your quiz will appear in “My Media.” You can click Go To Media to view your media. You must first enable the Kaltura Video Quiz Tool. 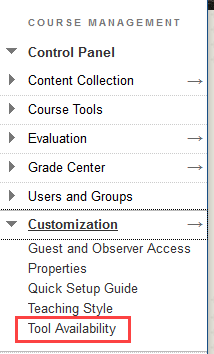 To do this, go to the Course Management menu on the left and click Customization. Scroll down and select the box next to Kaltura Video Quiz. 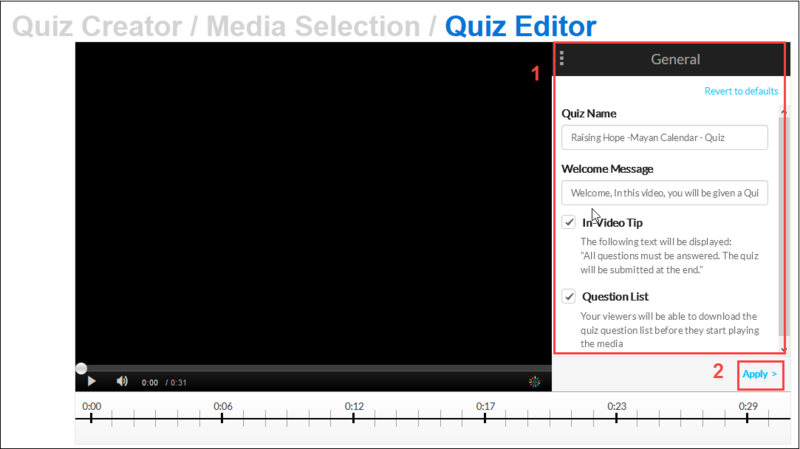 To make the Quiz available to students, click on the menu area where you would like your video quiz to appear. Hover over Assessments and click Kaltura Video Quiz. 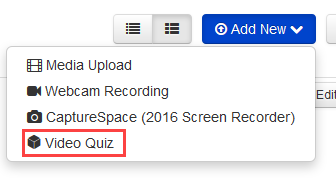 Click Select next to the video quiz you wish to upload. Name your file, choose your settings, and click Submit. 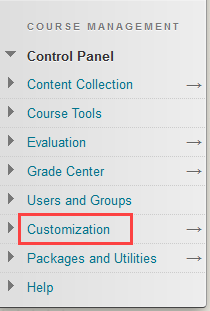 If you upload the quiz this way a grade center column will automatically be created in the Grade Center and a grade will automatically be entered when the student takes the quiz. New to Kaltura? See our Kaltura TIPS posts to learn how to create, upload, and edit a video using Kaltura.